It is passed time to update this blog, and I might just have found the way to do this! I finally managed to update this blog simply by using an editor on my laptop, and using some commands afterwards. Mind you, this ain’t some static site generator, this is a WordPress installation, you know the world’s most used CMS but also somewhat the most annoying. Well, WordPress just got somewhat easier and nicer – thanks to this great hack. So what is happening? Well I was busy today designing a workflow for my friend Jorge who is going to write the long due moneyless-book. I really needed to have a workflow that would be based on markdown file-editing, while using a git repository so I could give frequent feedback. And with the markdown files we could easily generate html and pdf files when we want them. Writing a book means you don’t want to end up with one superlarge file in some word-processor. This would easily become a big cumbersome, especially if you want to share and collaborate with others. Therefore, you really want to have e.g. an outline of sections in a sidebar, collapsible content, a build-in file browser, and a nice user interface that is build to make you type. 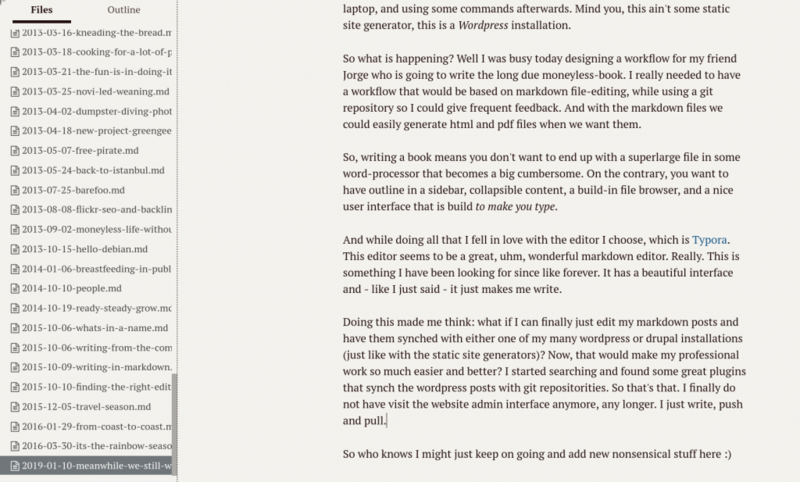 And while doing all that I fell in love with the editor I choose, which is Typora. This editor seems to be a great, uhm, ~~wonderful~~ amazing markdown editor (and mind you, I never use this oversaturated word ‘amazing’). This is something I have been looking for since like… f-o-r-e-v-e-r. And not only it has a beautiful interface, it actually makes me want to write. While designing the new workflow for the book, it made me think what if I can finally realize my personal web-editing dream? This dream is simple: To edit all posts and pages simply through my own personal editor of choice, and not through a bloated webinterfaces (plus without migrating my 20+ websites to a different cms such as Hugo or Grav). Realizing this dream would finally make my professional work much easier again and, above all, more fun! So I searched and found some new plugins that sync wordpress posts and pages with git repositorities. So that’s it. I finally do not have visit the website admin interface anymore, any longer. I just pull the content to my local machine, I write, and the pull. 1 second later the website has been updated. What’s only missing now, is an automatic push upon saving the document.